Movistar's Nairo Quintana crossed the finish line of the 13th stage of the Vuelta a España in the 21st position, at 2 minutes and 32 seconds from Oscar Rodriguez. The Colombian sits at the third position of the General Classification at one minute and 50 seconds from Jesus Herrada (Cofidis), after being the first of the favourites to cross the finish line at the Alto de la Camperona. "I'm happy with the result," said the rider at the end of the stage. "Another Vuelta has started today like it was expected. Possibly today was the first real mountain day of this race and every second that we can win counts. "It was important to start adding over our rivals and we did that. It has been a very hard and difficult day. It was everything very fast because of the breakaway in which there were riders that could be dangerous in the General Classification. Some of them seem to be far, but they still posed a threat. The team of the leader (Cofidis) tried its best but we and other teams had to help to control the escapees." 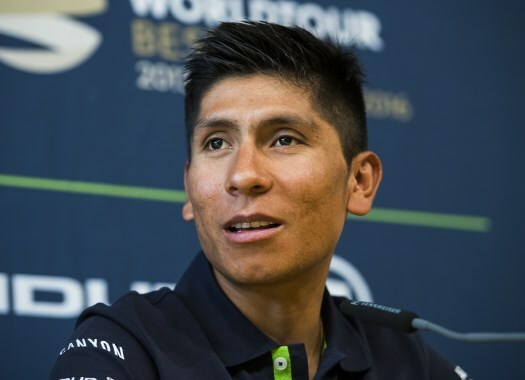 Quintana is awaiting the next mountain days to keep cutting time from his direct rivals. "La Camperona, or at least its most difficult part, it is very short and explosive and surely there were people that do better in this type or arrivals, but we did well," he explained. "We are waiting for the longer climbs to know for sure where we stand and, we hope, to make a difference. I expect to keep having good feelings. The team is doing a great job and that keeps me motivated. I don't know Les Praeres but it is clear that it would be a hard day."